The Tamales, is a Philippine rice cake made with rice flour, coconut milk and “achuete”. This rice-based goodie is topped with slivers of chicken, onions, peppers, carrots, potatoes, hard-boiled eggs. At times, toppings would also include Spanish chorizos, shrimps, cashew nuts, all nestled into the rectangle rice cake. 1. Mix together coconut milk, rice flour, sugar, salt and pepper. 2. Cook mixture in low fire for 25 minutes with constant stirring so as not to allow sticking on the pan. 3. Add the ground roasted peanuts and cook further for about 8 minutes, and stirring constantly. 4. Set aside one-half of mixture in a container. This is the regular mixture. 5. Add the atsuete juice to the remaining half, cook for 5 minutes while stirring constantly. This is the (colored) red mixture. 6. On a banana leaf (or tin foil) put 3 tbsp. of the regular mixture forming a 3-inch square shape. 7. Put on top the square pieces of chicken pork, ham, egg and peanut and shrimps. 8. 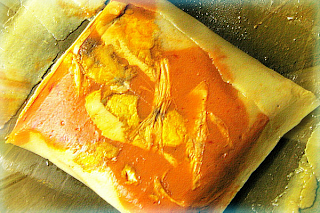 Cover with 3 tbsp., red mixture, wrap in banana leaves. About 6-8 pieces can be made from the mixture. 9. Arrange in a kettle and steam for 20 minutes.